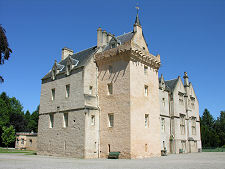 Brodie Castle can be found some three and a half miles west of Forres and is accessed from a well signposted minor road which turns north off the A96. The castle stands in extensive landscaped grounds, and as you enter them you pass the Rodney Stone, a very fine Pictish symbol stone moved here from another location in the 1830s. The visitors' car park is set amid trees to the south of the castle itself, and as you emerge from the trees you are, on a good day at least, greeted by the wonderful view above. The Brodie family can trace their roots, and their association with this area, back to Malcolm, Thane of Brodie, who died in 1285. It's been suggested that the castle you can see today contains within it elements of one or more earlier castles, possibly dating back as far as the 1100s. But without dismantling the structure it will be impossible to prove this one way or the other, so the presence, or otherwise, of an earlier castle looks likely to remain unresolved. The early generations of the Brodie family, or "Brothie" as the name was presented until around 1500, must have lived somewhere, however, and the site occupied by the castle does seem a likely location. 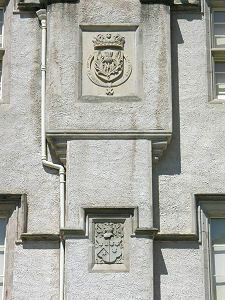 The earliest positive dating evidence found at Brodie Castle comes from a date of 1567 on the caphouse that tops off the south west tower. The laird of the day, Alexander, 12th Brodie of Brodie, had become involved in a rebellion against Mary, Queen of Scots in 1562, and his lands has been seized by the Crown as a result. His property, including the estate at Brodie, was returned to him in 1566. The suggestion is that he had begun work on building (or rebuilding) the tower house that still dominates the south west angle of the castle in about 1560, and resumed work when he regained the estate in 1566, with the tower being finished in 1567. The castle completed here in 1567 was a typical Scottish "Z-plan" tower house, with a rectangular main block supplemented by square towers set against diagonally opposite corners of the rectangle. The tower would have been topped off with corbelled out battlements and bartizans (circular turrets typically topped off with a steeply pitched "witches hat" roof). Alexander lived until 1583, and was succeeded by his son David, the 13th Brodie of Brodie. The 14th laird was another David, and in 1632 he was in turn succeeded by another Alexander, born in 1613. 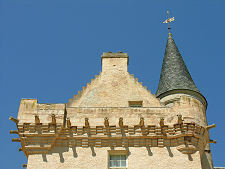 It was presumably either the 14th or 15th laird who, at some point in the first half of the 1600s, built a new wing at Brodie Castle, extending to the north of the existing tower house. Alexander, 15th Brodie of Brodie signed the National Covenant in 1638 (see our Historical Timeline), and served as a Senator of the Court of Justice in Edinburgh. He became involved in talks with Cromwell over the possible formation of a United Kingdom, and travelled to Holland to negotiate with Charles II. After the latter's restoration in 1660, Alexander found himself burdened with a large fine for signing the Covenant. He also had to effect repairs to Brodie Castle after it had been attacked and damaged in 1645 by the Royalist army under the Marquis of Montrose and Lord Lewis Gordon. Having chosen their allegiances poorly in the 1600s, the Brodies backed the winning House of Hanover during the Jacobite uprisings of 1715 and 1745. Alexander, 19th Brodie of Brodie, inherited the estate from his brother in 1720, and retained the reins until his death in 1754. The 19th laird left his mark on the estate in a number of ways, not all of them good. He undertook major works in the grounds, including the construction of radiating avenues and a canal. Within the house his major contribution was the construction of a new main staircase. By the time he died, Alexander's debts amounted to £18,268.15s.4½d, an enormous sum at the time. Alexander's son, yet another Alexander, survived him by only five years, and it was James, 21st Brodie of Brodie, who having inherited the estate at the age of 15 in 1759, saw out the century and a good chunk of the next one, living until 1824. In 1774 James sold the whole of the very large Brodie estate to his brother in law, the 2nd Earl of Fife, to help clear the debts he had inherited. The Earl generously returned the castle and its grounds to James but retained the remainder of the estate. James Brodie's grandson, William, became the 22rd Laird of Brodie in 1824, and set out to address the problems of what must have seemed a very out of date home. With this in mind he commissioned the architect William Burn to transform Brodie Castle into something befitting an affluent laird of the day. Only William was far from affluent. It says something for the scale of the proposed transformation that even though only a third of Burn's planned additions were ever built they still account for a large part of the eastern side of the building you see today. Further expansion was prevented by financial difficulties that were only resolved when William married the daughter of a wealthy landowner in 1838. His new-found wealth allowed William to bring in the architect James Wylson to tidy up the partly finished additions and make the new and old parts of the castle appear and function as more of a unified whole. Amongst the changes made by Wylson were the conversion of a storage cellar on the ground floor into a new entrance hall, and the conversion of two more storage cellars into the magnificent ground floor library. 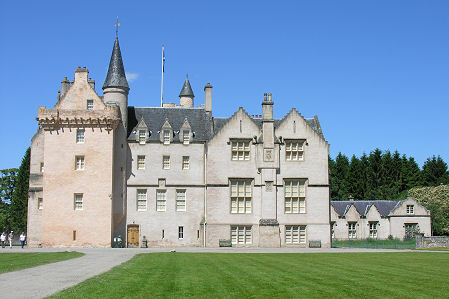 Despite intermittent financial difficulties caused by overambitious expenditure on their castle, the Brodies played an important part in the political life of the area. Like a number of lairds of Brodie before him (and subsequently) William served as Lord Lieutenant of Nairnshire, and a number of members of the family also served as local MPs. By the 1960s it was becoming clear to Ninian, 25th Brodie of Brodie, that the upkeep of the castle required more resources than could ever be provided by the estate, and discussions were opened with the National Trust for Scotland, who took over ownership of Brodie Castle in 1980. The castle has since been extensively renovated and is now held by the NTS in trust for the nation. The grounds surrounding the castle are home to a woodland walk that is especially striking when the daffodils are in bloom. 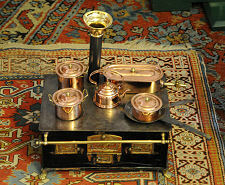 There is also a walled garden being brought back to life to help supply the tearoom, and an adventure play area. 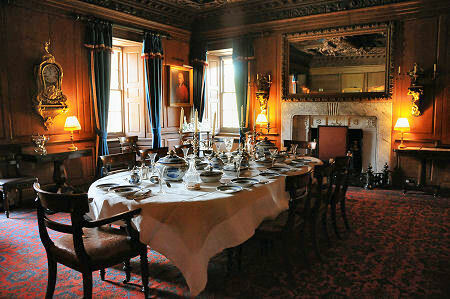 But the main attraction is, of course, Brodie Castle itself. The main entrance leads through into the arched entrance hall created by James Wylson in the 1840s. Off to one side is the vaulted guard chamber, a room which gives an excellent impression of the character of the original tower house completed in 1567. Objects on view range from the fascinating estate map drawn up in 1770 to the decidedly creepy skeleton of a child in a glass-fronted wooden box. The contrast on the other side of the entrance hall could not be greater, for here you find the library, the epitome of Victorian style and elegance. Perhaps the most striking features of the room, and one we don't recall having seen anywhere else, are the "island" bookcases spaced at intervals along both sides of the room. The effect is to increase the capacity of the library, while still giving a sense of considerable space, and allowing light from the windows to illuminate the whole room more evenly. Much of the woodwork on view was made from imported American oak, and it seems that the architect James Wylson had to work hard to prevent his patron, William Brodie, from painting the entire library white. We can all be thankful that Brodie was persuaded to keep to the natural wood finish. The stairs at the rear of the entrance hall bring you to the dining room, which vies with the library for title of "most magnificent room" at Brodie. 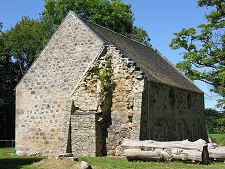 It is in the wing added in the early 1600s and this space was originally intended as the "laird's chamber" or main reception hall. It is unclear when the truly remarkable - if rather heavy and imposing - plaster ceiling was added, but it may have been at the end of the 1600s. Off to one side of the dining room is the Blue Sitting Room, a lovely vaulted room with an equally impressive, if rather more subtly applied, plaster ceiling. The Red Drawing Room is a reception hall and gallery, and is dominated by a magnificent wooden fireplace that occupies most of one wall of the room. 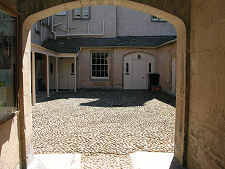 From here you pass through to the drawing room, housed within the new wing added by William Burn in the early 1800s. On our visit this was set up for a wedding, which helped bring home what a lovely venue (and setting) Brodie Castle is for weddings. Further on in your tour you have the opportunity of visiting a number of the bedrooms in the castle, including the Picture Room and the Blue Bedroom. Back on the ground floor there is an excellent tearoom within the rear of the 1800s wing, and beyond it you can visit the superb Victorian kitchen. At the back of the castle is a well stocked shop, and to the rear of the courtyard is an octagonal dairy.